The 2012 Red Sox are not a good baseball team, plain and simple. They have Pedroia, Gonzalez (went 0-8 today), and Ortiz, and that's it. The other six guys in the lineup are solid major league bench players, not every day MLB starters. Mike Aviles (SS): Has surpassed everyones expectations and has been solid for the Sox. But solid isn't going to get the job done in the AL East. He is a career .286 hitter in five seasons and is hitting just .257 this year. Ryan Sweeney (OF): Also has surpassed peoples expectations this season as he is hitting .354 on the year. He is a career .286 hitter as well and is a not what you would call a high-profile player. He is a "good" big league player. Cody Ross (OF): Has hit over .300 only once in his nine year career and has a .261 career batting average in those nine years. Ross is hitting .267 this year with five home runs. Ross is another guy who at this stage in his career is a solid bench guy to have on your team. But to be an every day starting outfielder in the AL East? Nope. Jarrod Saltalamacchia (C): There was a point in Salty's career where he went to see a sports psychologist because he couldn't throw the ball back to the pitcher, literally. He is also a career .244 hitter and is hitting .238 this year for the Sox. Granted catchers aren't known for putting up great offensive numbers, but let's not forget about the Sox 29th ranked ERA with a 5.44. Salty is in charge of the pitchers and has to be held somewhat responsible for the terrible ERA. Will Middlebrooks (3B): The Sox top prospect has adjusted well to the big leagues, but he is not a proven big leaguer by any means. Middlebrooks hit his first career home run today (grand slam) and is on his way up to making a name for himself. Marlon Byrd (OF): An early season trade between the Sox and Cubs brought Byrd to Boston who was 3 for 43 in Chicago this season (.070 BA) and is hitting .256 as a Sock. This season marks Byrd's 12th season in the Bigs and his "prime" is far behind him. Nick Punto: Hitting .148 on the year with nine strikeouts in 27 AB's. Kelly Shoppach: Hitting .242 with 16 strikeouts in 33 AB's. For all you non math wizzes, that means he is striking out almost 50% of the time. Darnell McDonald: Hitting .184 on the year. To sum it up, the every day starters are solid bench players for MLB standards, and the bench players are every day AAA players, not MLB players. Not a very good recipe for success. Thanks, Theo. Jon Lester: The supposed "ace" of the staff has posted a 4.62 ERA and is 1-2 on the year. Josh Beckett: The other guy who is supposed to have "ace" stuff has a 4.45 ERA and is 2-3 in five starts. Clay Bucholz: Where should I start with Mr. Bucholz? He has an 8.69 ERA (league worst) and has given up seven home runs already. His 1.897 WHIP is also among one of the leagues worst. Opponents are hitting .331 off of him. Felix Doubront: He has been one of the more consistent starters for the Sox, but still has a 5.19 ERA. Doubront is a definite work-in-progress but has looked O.K. this season. But being just O.K. is not acceptable if you are wearing a Red Sox uniform. Daniel Bard: You can argue he has been the most impressive starter this season. Bard has posted 4.38 ERA and is 2-3 on the year. Pretty remarkable when you are reminded that he hadn't started a game since 2007. Granted the Sox have $79 million on the disabled list right now, there aren't any excuses for being seven games back and 11-16 overall other than simply not having the talent. 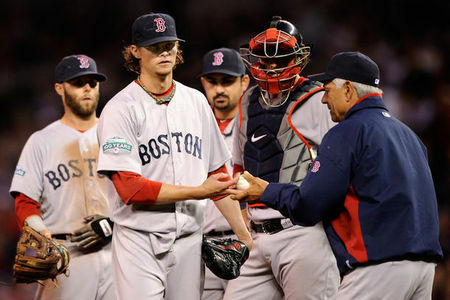 This 2012 Red Sox team is only going to be as good as their starting pitching. Ellsbury will be back, Crawford will be back, and you have to think Gonzalez will snap out of his funk sometime soon. But as for now, this team just doesn't have the talent and it's no surprise that they are seven games back in the AL East. I also want to add that this is not Bobby Valentine's fault at all. Yes he has been a batter too late here and there with the pitchers, but when it comes down to it, the players have to perform and they haven't been. He also doesn't have many options on the bench or in the bullpen as we have seen. Cherry on top: Chris Davis picked up the win against the Sox today. He is a position player.